Over a 70-year career, Takis (Panayiotis Vassilakis, b.1925) has created some of the most innovative art of the 20th century. A sculptor of magnetism, light and sound, he seeks out the essential poetry and beauty of the electromagnetic universe. Takis was one of the most original artistic voices in Europe from the 1960s and remains a pioneering figure today. Tate Modern will stage Takis’ largest exhibition in the UK, bringing together over 70 works, including a rarely-seen Magnetic Fields installation, musical devices generating resonant and random sounds, and forests of his pivotal Signals. Born in Athens in 1925, Takis is a self-taught artist who moved to Paris in 1954 and became a key figure in the artistic and literary circles of Paris, London and New York. His inventions earned him the admiration of the international avant-garde, from William S. Burroughs and the American Beat poets to artists including Marcel Duchamp. Takis was at the forefront of kinetic art and pioneered new forms of sculpture, painting and musical structures to harness invisible natural forces. Throughout his career, he produced antennae-like sculptures called Signals – thin, flexible poles topped with found objects or electric lights – which gently sway in response to their surroundings. His idea for these works emerged while waiting at Calais train station surrounded by ‘monster-eyes’ going on and off in a ‘jungle of iron’. The renowned Signals London gallery and publication (1964-66) was named after Takis’ influential series and became an important meeting place for the transmission of ideas, breaking down boundaries between the arts and sciences. From the late 1950s, Takis became increasingly fascinated by radar and began exploring magnetism as a way to reinvent sculpture. In 1960, he created the ephemeral action The Impossible - Man in Space, in which he suspended the poet Sinclair Beiles in mid-air through a system of magnets while he recited the poem Magnetic Manifesto. The exhibition will include Takis’ ‘telemagnetic’ works, incorporating metallic objects that float with the use of magnets, such as Magnetic Wall 9 (Red) 1961 where abstract elements hover on the surface of a bright red canvas. Takis was an expert at manipulating electronics and mechanical components to build suspense within his art. Shown in a darkened gallery, the radiant blue light of Télélumière No. 4 1963-4 crackles with energy. A highlight of the exhibition will be Magnetic Fields 1969, on display for the first time since the 1970s, in which magnetic pendulums trigger movement from nearly a hundred sculptures. Takis sourced many of his materials from military surplus shops and flea markets. From the radio antennas of US army jeeps to salvaged aeroplane gauges, he transformed technologies of warfare into monuments of beauty and contemplation. In his Signals from the 1970s, he incorporated various bomb fragments from the Greek Civil War gathered from the hill around his Athens studio. Takis was also involved in a number of direct political actions, particularly in the late 1960s. He was a leading participant of the Art Workers’ Coalition and his decision to forcefully remove his work from an exhibition at the Museum of Modern Art in New York became a rallying point for artist rights. In Athens in 1986, he founded the Takis Foundation – Research Center for the Art and the Sciences, which has been the home of his artistic work and research ever since. 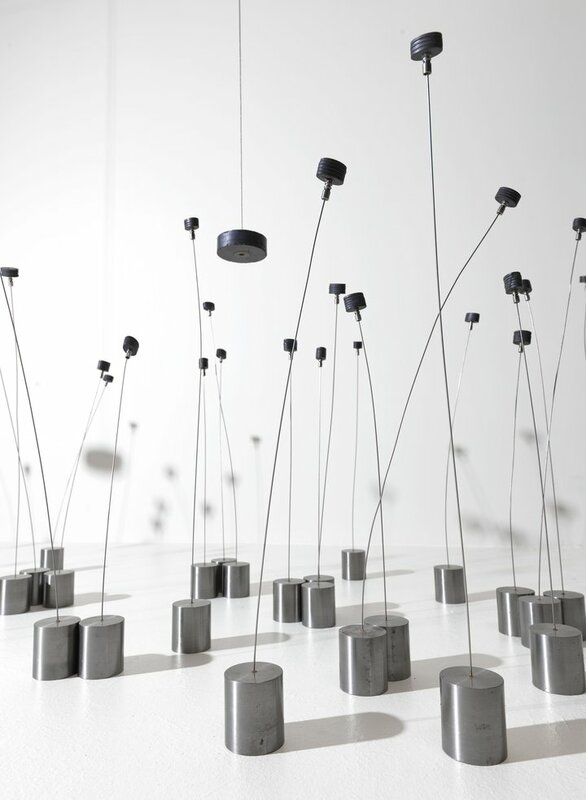 Since 1965, Takis has created new musical devices with magnets, electricity and often viewer participation, to produce sounds that he speaks of relating to the cosmos, ranging from single notes to thunderous ensembles. At the centre of the exhibition will be a gallery dedicated to a sequence of Takis’ Musicals. The exhibition will close with Takis’ Musical Sphere 1985 and Gong 1978, made from the rusted wall of a tanker. Takis is co-curated by writer and curator Guy Brett, who was closely involved in Signals London, and Michael Wellen, Curator, International Art, Tate Modern, with Helen O’Malley, Assistant Curator, Tate Modern. It will be accompanied by a catalogue including specially commissioned colour photography and new critical essays. The exhibition is organised by Tate Modern in collaboration with the Museu d’Art Contemporani de Barcelona, where it will open on 21 November 2019, and the Museum of Cycladic Art, Athens, where it will open on 20 May 2020.